My research explores political imagination in Greece during the current historical moment, which is often labeled “the Greek crisis” (a term I scrutinize and unpack). It focuses on Greece’s relationship to the West and the re-charting of geographies of imagination and desire binding ‘the North’ to ‘the South’. The project looks particularly at the Greek-German component, following tensions in public spheres after the 2010 implementation of a bailout deal and associated austerity measures in Greece. My study does so by thinking through visual culture and photography as realms of political engagement that may illuminate questions of desire, imagination economy, asymmetry and memory. 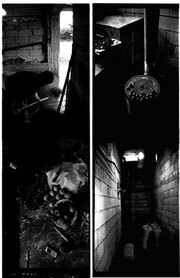 I also explore photographs in terms of possibilities of “citizenship” and imagination; in relation to what they may reveal about imagining others and enabling political spheres of co-existing with them. My research involves fieldwork (over 12 months in 2017 and 2018) in three different sites in rural Greece and it also incorporates social engagements occurring on digital platforms and art shows as well as conversations among people in Athens. 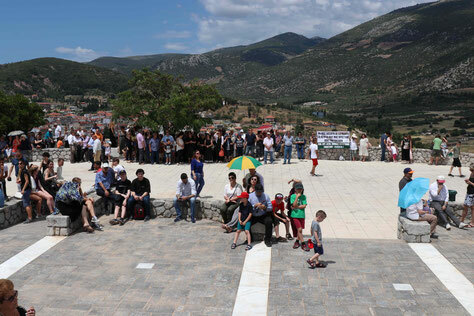 The research is immersed in an array of social domains: villages in highland Crete; Cretan coastal tourist destinations; mainland Greek towns that suffered massacres in the 1940s by German Nazi troops currently at the center of political debate given reconfigurations of Greece’s relationship “to Germany”; the exhibition Documenta 14 and subsequent discussions and performances that brought “colonialism” and “neoliberalism” to the forefront of public debate and so on. In my research, I participate in various social domains and engage with people in various positions. They include interlocutors and friends I have known since my first 2006 fieldwork in rural Crete, German anti-fascist activists fighting for Germany to pay compensations to families of victims of the 1940s German Occupation, young Greek urbanites trying to make a living in Athens, curators and visitors of museums and memorials dedicated to the 1940s German Occupation, art groups commenting on Greece’s position in the global hierarchy of value, German tourists coming back to Cretan hamlets they first visited in the 1960s and giving back their old photos to families of those depicted in the pictures. The images that I explore include archival material from the 1940s, portraits of people’s ancestors taken by tourists, digital reuses of old images for the purposes of satire and political commentary, family photographs on people’s walls and wallets, portraits of deceased kin, photos I took during my first fieldwork over 10 years ago and returned today, photos taken by my interlocutors and posted on Instagram and Facebook, etc. These images may be carefully stored, decorated, reproduced, deleted, commented upon or even destroyed. They may fuel anger, tenderness, dialogues, and various kinds of recollection. I have currently finished fieldwork and I am writing up a book as well as preparing individual chapters and papers for collective volumes, journals and other venues. I am also co-designing an upcoming course to be jointly taught by the PhotoDemos team at UCL Anthropology in the Spring Term. 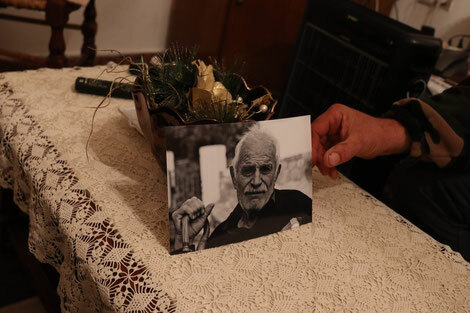 A man places a portrait I took in 2007 on the table at the house of the now deceased sitter's brother, Western Crete, 2017, Photo by K Kalantzis. 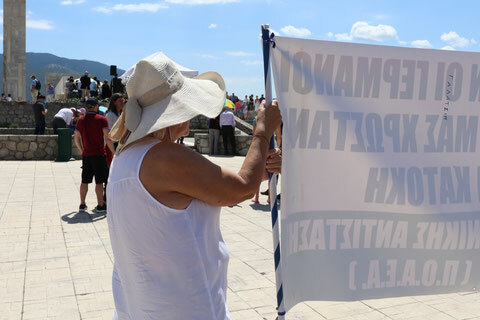 A woman holds a banner with a message for the German government to pay compensations at the memorial of the victims of the 1944 Distomo slaughter by the German Nazis, June 2018, Photo by K Kalantzis. 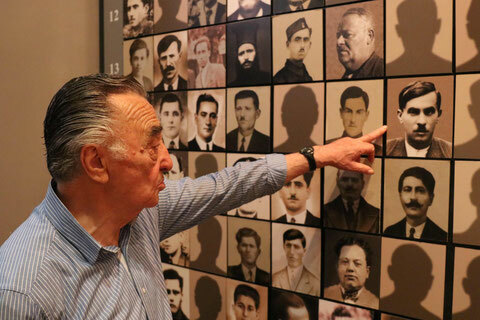 Giorgos Dimopoulos showing me the portrait of his father on the photo wall of victims of the 1943 civilians' slaughter by the Wehrmacht at the 'Municipal Museum of the Kalavryta Holocaust'', 2018, Photo by K Kalantzis. At the Distomo monument for the 1944 slaughter of civilians by German Nazi SS troops, June 2018, Photo by K Kalantzis. 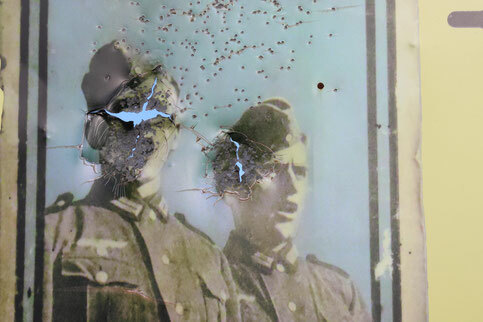 Close-up of road sign advertizing a historical collection of objects from WWII with bullet holes, Western highland Crete, 2017, Photo by K Kalantzis. 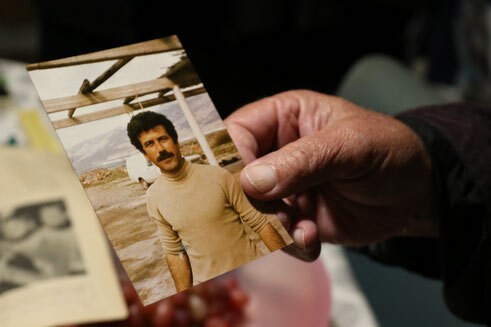 Kostis Papadakis showing me picture of himself at a young age, taken by a tourist visiting Frangokastello in southwestern Crete, c. 1970, 2017, Photo by K Kalantzis, Original photographer of small image unknown. 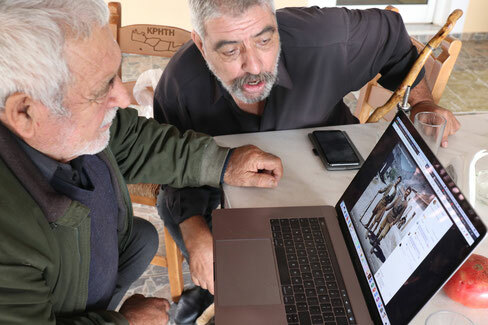 Manousos Nikiforakis and Leonidas Katsanevakis discussing an archival photo of covillagers (western highland Crete) from the 1950s posted on Facebook, 2018, Photo by K Kalantzis. 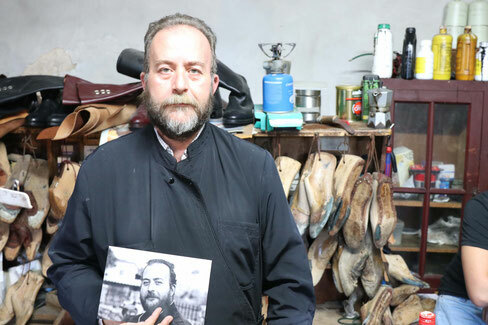 Stelios Katsoulakis showing me a portrait of himself that I took in 2006, Western Crete. 2018, Photo by K Kalantzis. 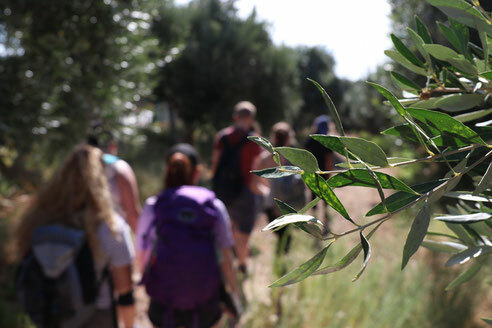 Students from a non-Greek university visiting Crete are given tour in an olive grove which has become a tourist site in recent years, 2017, Photo by K Kalantzis.